There was a bit of a drama involved with getting to the spinning course. The dates on the website differed from the dates on the invoice, so all five of the people on the course got the wrong day. Some of us turned up a day early, others changed plans to come on the day the invoice said. What do you want to learn about spinning? Interesting question. I’m fairly sure I could learn to sit and spin without thinking too much about it, but that’s not really what intrigues me about the whole business. Spinning seems to me to be a craft, where learning the technical aspects will pay dividends. So that is what I learned over the next two days. After five minutes of Ruth looking at what I was doing, she suggested changes to the way I was holding my hands and drafting. I changed to drafting forwards and, after being shown how to untwist the yarn while drafting, within minutes I was producing a fine, even thread. Amazing! That would have been enough to make it worthwhile, but there was more. We learned about the gears on the wheel and how to use them accurately, we looked at calculating the number of twists per inch when spinning and how that equates to the number of twists per inch in plying, we discovered the desirability of producing yarn that has a slight Z-twist once plied, not to mention looking at Andean plying, making rolags, long draw spinning and so on. I came away with a head full of knowledge (and a little bit of fibre to play with – well, it would have been rude not to). Since then, I’ve struggled to find regular time to spin but I can still see the improvement in my technique. Now I’m saving up to buy my own spinning wheel. First, a selection of samples, all spun on the same wheel with the same fibre, just changing the wheel settings. 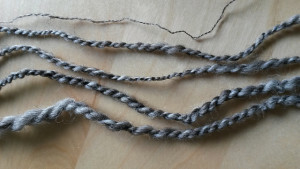 Now a skein of well-balanced yarn that looks as if it might actually be useful for knitting. I’ve also got another skein of yarn that needs a bit of re-plying in order to be right. The big long socks of misery are off the needles, blocked and ready to send. Almost instantly, I felt a lightness of spirit and dived back into my various knitting bags to see what was lurking within. I spent an evening knitting on a lace sock, before sitting down to think about what would be the biggest win to finish. The conclusion? Finish the swirl. Originally cast on new years day 2013, this project reaches its second anniversary later this week. I’ve knitted to beyond the halfway point now and I have momentum. There’s a handy thread on the swirl ravelry group that tells you the halfway point in each pattern. 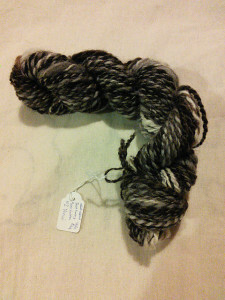 I have slightly less than half the yarn left, so another skein of the dark grey is on the way here. I’m hoping that means I won’t run out after all, but better safe than sorry. My aim for the next couple of months is to operate a finish two projects for each one started policy. 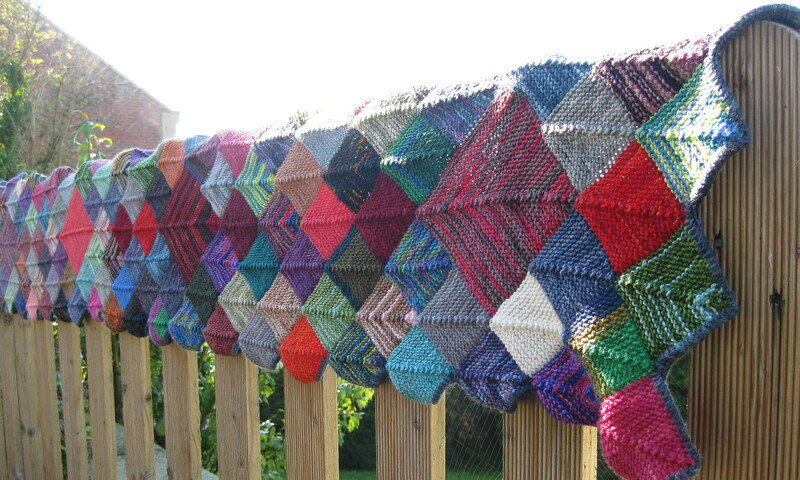 It would be lovely to cast on some of those patterns that I’ve been thinking about for years.